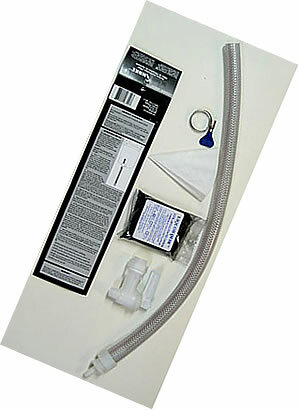 An inexpensive easy-to-use carbon purification system for alcohol. One packet of granulated carbon included. The CarbonSnake™ is an inexpensive, easy-to-use carbon purification system.It will remove unwanted odors and flavors from fermented alco-bases (i.e. distiller's yeast/nutrient blends, SuperYeast™, turbo-yeast) and ethanol distillates (i.e. grain or sugar alcohols). Assemble The CarbonSnake™ and attach to a pail as per the diagram above. The CarbonSnake™ is manufactured of food-grade, ethanol resistant plastics. Before and after each use, sterilize the hose, tap and connectors with a non-corrosive cleaning agent such as sulphite or Oxy-San™, and rinse well with clean water. The hose assembly requires 2 oz. (60 g) of distiller's granular activated carbon (GAC). For best results, we recommend a beverage-grade, low-neutral pH, pre-washed granular DARCO stone carbon, 20x40 mesh (0.42mm–0.85mm size particles). Pries lids off fermenting buckets. High quality distiller's activated carbon. Equipment and additives to make wine from fruit and berries.